If all of the organs of your body got all of the energy all of the time there would not be enough energy to go around. Each organ has its time during the day when it gets the most energy. Based upon the organ circuit clock we can see that the bio-rhythms of the body can get very messed up. The whole clock can be altered due to illness, jet-lag, and switching work shifts from day to night, medications, and electromagnetic pollution from wifi, cell phones and computers. The Chinese discovered and mapped the organ clock thirteen centuries ago and it has stood the test of time. 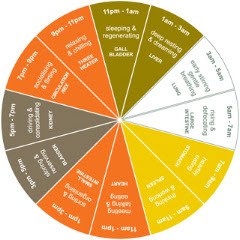 Understanding this body clock is important for both you and your doctor. Many people tell me their symptoms get worse or better at a certain time of day. This is a great clue to a doctor who knows the organ clock. If the symptoms are worse at night between 1 a.m. and 3 a.m. then the doctor knows that the liver is a good place to look for the source of that problem, since the liver is most active at that time. Notice that the bladder and kidney circuits should be essentially "turned off" at night, since they have their turn of highest energy between 3 p.m.-7 p.m. So for all of you who urinate all night, yet justify it by the fact that you drink a lot of water, your clock is likely messed up. It is interesting that your bowels should eliminate soon after you awaken to start the day "fresh". Also interesting is that the heart's time of highest energy is between 11 a.m. and 1 p.m. Lunch time is when most heart attacks occur. All this is just to show how beautifully we are made, and how just killing bacteria, detoxing, taking supplements, exercising, and eating well is not all that is needed to heal. So...not only does it take time to heal, but we must also heal our organ time zones! Organ Time Zone (OTZ) problems are caused by interferences in the body's regulation, such as illness, medications, and environmental factors. All of the organs and glands are interdependent and must work in unison. If one organ is struggling, it throws off all of the others. It is like an orchestra playing a beautiful classical piece of music, and suddenly a trumpet player breaks out into a Hip Hop song. The rhythm of the entire orchestra is thrown off. Organ time zone problems are medically referred to as desynchronosis, or chronobiology, which is a physiological condition which results from alterations to the body's circadian rhythms. Anyone who has traveled overseas has experienced desynchronosis in the form of jet-lag. The circadian rhythms of the body are most often associated with our waking and sleeping schedule, however it also includes the shifting of the organ energy levels. People with thyroid and adrenal weakness often feel best just before bedtime. From the chart you can see that energy shifts to supply these glands between 9-11 p.m. It is sad because they feel horrible all day long, and just when everyone else in the house is tired and ready for bed, these people are just hitting their best time of day and don't want to go to sleep. In this case, it is not that they are on the wrong time zone, meaning maybe their liver is going active when the thyroid and adrenal glands are supposed to be active. In this case, you can see that these glands are weak (often even with medication to treat these glands) and the reason they feel better is that there is more energy being sent to the glands. If we correct the time and energy aspects of the thyroid and adrenals, as well as all the other associated tissues and issues, these people can often get back onto a more normal sleep schedule and feel energized throughout the day. A common example of OTZ problems is seen when the bladder circuit, which should have its time of highest energy between 3-5 p.m., instead turns on in the middle of the night. You can see from the chart that the bladder's time of highest energy should be between 3-5 in the afternoon, so if it is active at 3-5 a.m. it indicates that the body's time zones are off off by six time zones! Organ time zone problems cannot be detected by blood tests, nor are they corrected by medications and natural supplements that strive to do for the body what the body should be doing for itself. Thyroid medication is a good example of this because they are most often providing the body with the thyroid hormones, instead of working to restore the thyroid's ability to do it for itself, the way is was designed. Of course, if the thyroid has been destroyed for whatever reason, these medications are the best thing you can do. The OTZ for the thyroid can still often be reset to the correct time and energy, even if the gland itself does not work perfectly. Often the body clock will be temporarily shifted when an organ or gland is so dysfunctional that the wisdom of the body knows it needs to keep the majority of its energy going to that situation. Although all of the other organs still get some energy throughout the day, the majority of energy is going to fight the infection or whatever issue is affecting the organ. A real problem is seen when multiple organs and glands are being attacked and are dysfunctional, as seen in infections that can affect every system of the body, such as Lyme disease, mold issues, and other microbial attacks. Now the body's energy is spread out all the time, in an attempt to provide each affected organ or gland with the energy it needs to fight and repair. The body's energy production cannot keep up with the demand and global chronic fatigue sets in. OTZ problems go largely undetected and unaddressed by the vast majority of doctors because they are focused solely on the numbers on your blood test. Not only that, but the energetic nature of the human body is only mildly acknowledged in the mainstream. Doctors would need to actually come out from behind their desk or look up from the patient file and do energetic testing. That is not likely to happen anytime soon. OTZ problems can only be addressed by a doctor trained to detect and correct the body's energetic clock and organ time zones. 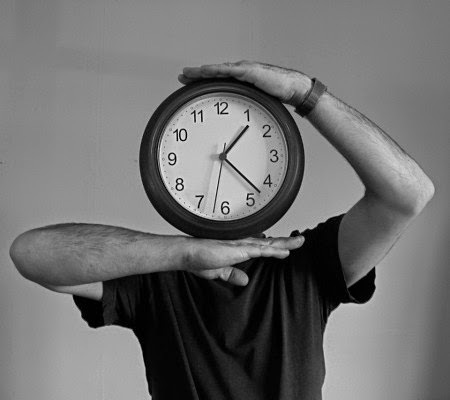 In the mess that most chronically ill people's body are in, it makes sense that if the goal is to restore the body's ability to heal from the inside out, then reseting the proper body clock time zones would be an important thing to do. Of course, not ever case of excessive urination at night will be due to OTZ issues. Not every case of insomnia, coughing, pain, neuropathy, and such, can be blamed on OTZ problems. The concept goes much deeper than this article can cover. Click on this hyperlink to see that organ desynchronosis includes all the rhythms of the body, right down to genetic rhythms. This is why the simplistic idea that drives most of modern day medicine, that every organ and biochemical can be pharmaceutically forced to behave, is really flawed. Forcing the body into drug-induced illusions of health, symptom-suppression, when there are better treatment options, is just throwing off the rhythms of everything. Much of the conventional and even many natural medicine treatments are what I call, "Pieces and Parts Doctoring." Resetting the organ time zones requires advanced testing and treatment skills, and will require ongoing reinforcement from the remedies, treatments, and lifestyle modifications to result in longterm correction. Ideally, in this day and age of electro-polution and other life challenges, you would see a healthcare professional quarterly at the very least to check and readjust things in order to maintain optimum rhythms. No matter what treatments the doctors at the Hansa Center use, from the first office visit to the last, they are always checking to ensure that the remedies and treatments are all working with the natural rhythms of your body. Call today and let us help you get your body clock set correctly!